"Choose Your Tag": a mostly complete list? A few weeks ago, a few of us started talking about ranks and tags, and one in particular wondered if there was some sort of "master list of chosen tags". Well, there wasn't, so I started compiling one, and got about two thirds through the entire thing, before I gave up and asked the nice people who run the forum if they could generate a list. It should be complete as I've updated it with the members who "graduated" most recently, but I definitely will keep maintaining it in the future. Hopefully, some of you will get a kick out of some tags (I know I did), and will refer to it for inspiration for future tagging. I knew I've tagged several people over the years, but I didn't realize it was that many. I actually got lost trying to find you because I swear I traced my "lineage" and found it originated with Certis (and yes, I took some pride out of that fact). I must have looked in the wrong column the last time I searched the spreadsheet, the graph doesn't lie. Interestingly, the different clusters are disconnected because their origin points are either by someone without a tag tagging someone else or by a cycle spontaneously originating a new cluster. Or self-tagging, in the case of Certis. The handful of self-tagged non-Certis people mostly have smaller clusters. Some of the disconnected clusters might eventually connect if the originating user eventually gets tagged. And there's a "Quentin_Stone" misspelling in a couple of spots, unless Q-Stone has a doppelganger I don't know about. My pc is unhelpful reading the chart. I think SwampYankee tagged me and I contributed 2 tags. I know I've recommended some truly awful and wtf tags, I'd hate to see that graph. Almost none of my "children" have tagged anyone else. What a terrible "father" I must have been. You show up as self-tagged, and have tagged 7 people (Freyja, Redwing, Flintheart Glomgold, Dezlen, Ballotechnic, SocialChameleon, and PandaEskimo). And there's a "Quentin_Stone" misspelling in a couple of spots, unless Q-Stone has a doppelganger I don't know about. Whoops!!! This one is on me, thanks for pointing that out, Gremlin. I've fixed it in the Goodjesday Book. Is there a way to view it bigger, is it on Google docs or something? Sorry for my dumb questions, my son is 5 so I sometimes need to ask in vaguery or find an easier solution due to time constraints. The large blue network on the right traces back to the first few site users, with Certis' tagging of KrazyTaco[FO] leading to the bulk of tags on the left, with Ratboy and fangblackbone as the roots of the branches to the upper right. Those four, particularly Sanjuro, are the collective root note for most of that light green cluster. The purple cluster is a chain of Geck > Rezzy > KatherinLHC > Haakon7 and friends. If it comes up as a white screen, that's just because you're lost somewhere in the upper left corner and need to scroll around to find the nodes. Puttin' on the foil, Coach! A mote of dust, suspended in a sunbeam. 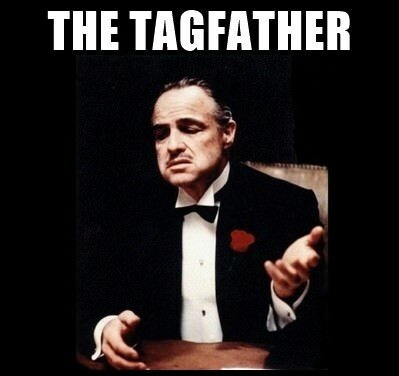 Awwww, knowing that I was LobsterMobster's TagFather makes me even sadder now that he's passed away. Also, I still get a chuckle whenever I see Ruhk's tag, but it's been so long that I forgot that I apparently tagged him! Nice list, though. I guess. Jerks. You underestimated yourself! See, you could do it! Add sir robc to the list! edit: Also, I just looked at the Great GWJer Graph of Tagging (GGGoT) and saw the sheer number of taggings Dr Awkward had achieved. What a legacy! Oh, he was on the list, don't worry groan! This is a phenomenal compilation! Well done! I had a little help. I am very proud to have been tagged by Edwin and spawn my own little cluster of taggings. So Eleima has a thread that effectively replaces this. And it contains a spreadsheet with links to all the tagging threads. So cool. Didn't you just link back to this thread? Isn't the thread you're describing the thread you're posting in? Am I insane? PAX South 2019 badges are on sale NOW! Join the fun! I posted that in the old thread that got bumped Friday. Not here. I admire your attempt at the Jedi Mind Trick, sir, but I'm not so feeble-minded as that! Take comfort in knowing that catching your ninja edit absolutely made my day. This is definitely the thread that you are looking for. Damn you. I'll see you in the football thread. Was just checking/figuring out what it takes to get a tag and stumbled across this. This is fantastic work. I wonder if I'm the oldest joined date member (lurker) who doesn't have a tag? I joined the site back in December 8, 2003. Holy crap, that's almost 15 years ago. Also, in looking at this, Certis and Elysium "joined" January 9th, 2003. So does that mean the GWJ website is 15 years old this year? We missed the 15 year anniversary!? Well, for logistics purposes, I can’t keep track of all people who have not yet acquired a tag. I suppose there’s a database, somewhere, but that would be a really big database. So I guess I don’t know. Also. Yes, I guess we missed the site’s fifteen anniversary! Certis was probably off meditating in the woods and Elysium was likely playing the fourteenth expansion to EU4.